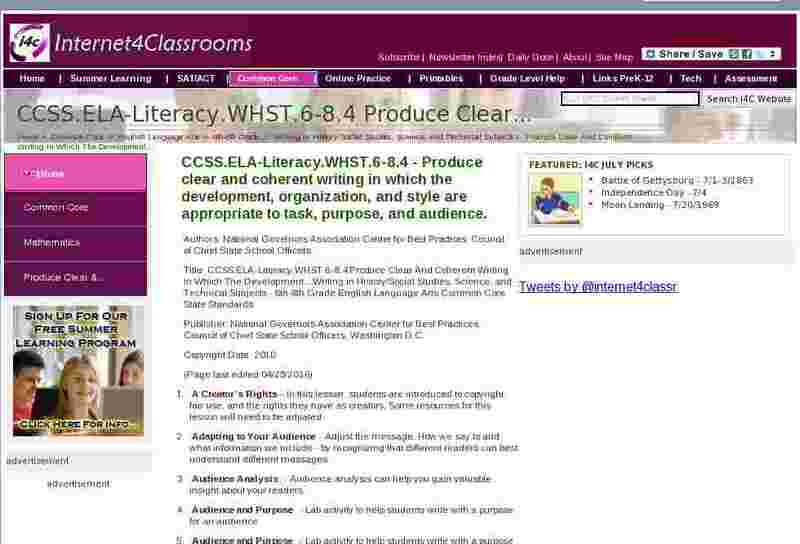 CCSS.ELA-Literacy.WHST.6-8.4 - Produce clear and coherent writing in which the development, organization, and style are appropriate to task, purpose, and audience. A Creator's Rights - In this lesson, students are introduced to copyright, fair use, and the rights they have as creators. Some resources for this lesson will need to be adpated. Classical Civilizations - A unit plan on Classical Civilizations consisting of 12 lessons with resources. My Media - In this lesson, students review their media habits and the array of media they use on a weekly basis, and reflect on the role of digital media in their lives. Ocean Currents and Salinity - In part one of this two-part lesson students work in pairs to explore the effects of salinity on ocean strati?cation using a simple plastic shoebox-sized container in which they create a mini-ocean environment. So You Want to Be an Archaeologist? - In this lesson students take the perspective of an archaeologist to investigate and assemble an artifact, and to use evidence to draw conclusions about its identity and function. Straw Rockets - Applying Newton's three laws of motion, students design an investigation involving straw rockets. The five tasks have students develop their writing skills by having them practice formulating a question, paraphrasing text, developing a hypothesis, constructing a procedure, and analyzing data to draw a conclusion. The final performance task requires them to aggregate these portions of a lab report as well as make real-world connections from what they learned. Surviving and Thriving - Lesson 2: Washington's Orders - In this lesson, students will work as a small group in making decisions and fostering discussion. Students will examine primary source materials and engage in a model hut building exercise. Surviving and Thriving - Lesson 3: Breakfast...Lunch...Dinner? - In this lesson, students will examine a sample of historical fiction and describe Continental Army fare while constructing a journal entry from first-person perspective. Surviving and Thriving - Lesson 4: Keeping the Doctor Away - In this lesson, students will assess Revolutionary-era sanitation/health guidelines and then view a video segment that highlights specific issues of healthcare for the Continental soldier at the Valley Forge encampment. Surviving and Thriving - Lesson 5: The Daily Routine - In this lesson, students will evaluate activities that Continental soldiers may have engaged in at the Valley Forge encampment. Then, students will construct a Continental soldier's daily routine using timeline skills. Which Me Should I Be? - In this lesson, students learn that presenting themselves in different ways online carries both benefits and risks.